Why Does My Apple Watch Battery Die So Fast? Here's The Fix! 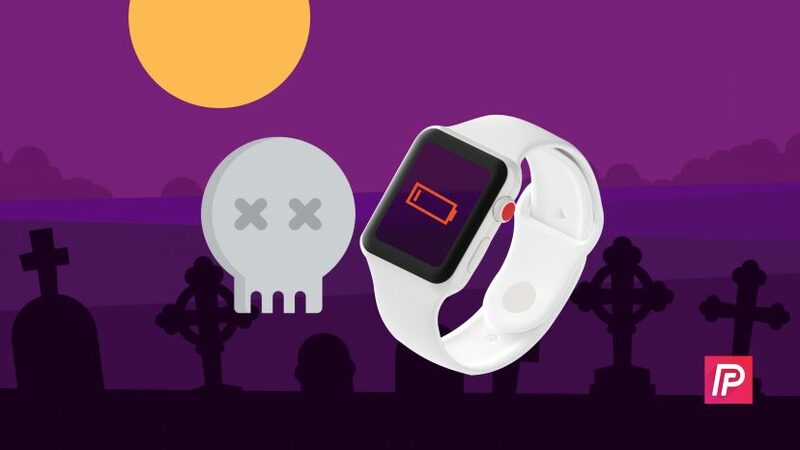 You are at:Home»Apple Watch»Why Does My Apple Watch Battery Die So Fast? Here’s The Fix! You’ve been disappointed with your Apple Watch battery life and you want to make it last longer. In this article, I’ll explain why your Apple Watch battery dies so fast and show you how to optimize your Apple Watch to extend its battery life! The Apple Watch Series 3 is designed to last 18 hours on a full charge, but we don’t live in a perfect world. Unoptimized settings, software crashes, and heavy apps can all cause significant Apple Watch battery drain. Is Something Wrong With My Apple Watch Battery? I want to clear up one of the biggest misconceptions when it comes to Apple Watch battery issues: almost 100% of the time, your Apple Watch battery dies so fast because of software issues, not hardware issues. This means that there’s a 99% chance that there’s nothing wrong with your Apple Watch’s battery! In this article, I focus on battery tips for watchOS 4, the most recent version of Apple Watch software. However, these battery tips can be applied to Apple Watches running earlier versions of watchOS. Without further ado, let’s begin with a common feature that most people don’t realize is draining their Apple Watch’s battery life: Wake Screen on Wrist Raise. Does your Apple Watch display turn on every time you raise your wrist? That’s because a feature known as Wake Screen on Wrist Raise is turned on. This feature can lead to major Apple Watch battery drain as the display constantly turns on and back off. As someone who does a lot of computer work, I immediately turned this feature off after seeing my Apple Watch display light up every time I adjusted my wrists while typing or browsing the internet. 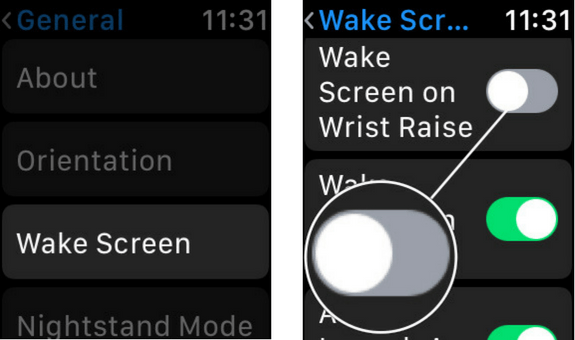 To turn off Wake Screen on Wrist Raise, open the Settings app on your Apple Watch and tap General -> Wake Screen. 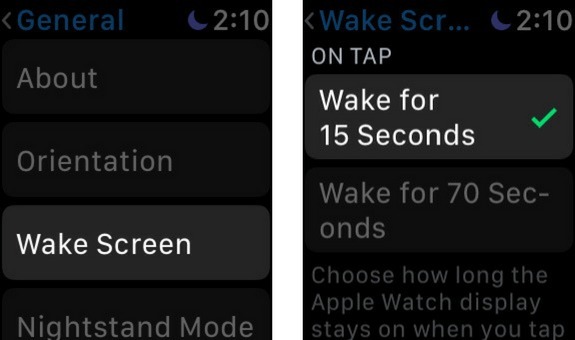 Finally, turn off the switch next to Wake Screen on Wrist Raise. You’ll know this setting is off when the switch is gray and positioned to the left. If you frequently exercise while wearing your Apple Watch, turning on Power Saving Mode is an easy way to save on battery life. By turning this feature on, the heart rate sensor will be turned off and calorie calculations may be less accurate than usual. Fortunately, almost all of the cardio machines at your local gym or fitness center have built-in heart rate sensors and monitors. In my experience, the heart rate monitors on modern cardio machines are almost always as accurate as the one in your Apple Watch. I’ve tested this a few times at my local Planet Fitness and found that my heart rate tracked on my Apple Watch was always within 1-2 BPM (beats per minute) of my heart rate tracked on the elliptical. 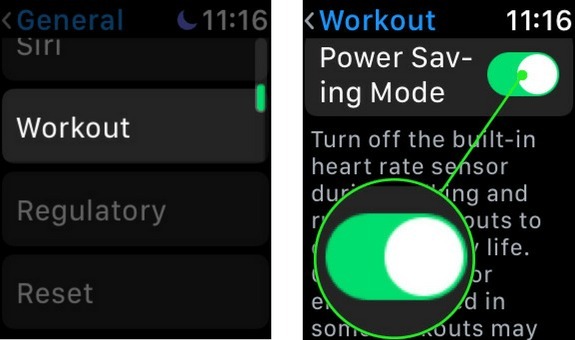 To turn on Power Saving Mode for the Workout app, go to the Settings app on your Apple Watch, tap General -> Workout, and turn on the switch next to Power Saving Mode. You’ll know the switch is on when it’s green. If you’ve recently worked out, it’s a good idea to check the Workout app or your third-party fitness app to see if it’s still running or has paused activity. 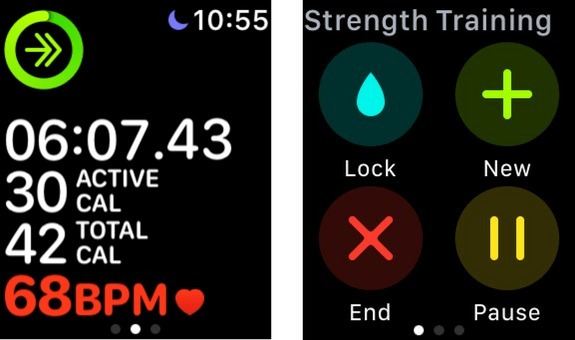 There’s a chance your fitness app is still running on your Apple Watch, which could be draining its battery because the heart rate sensor and calorie tracker are two of the biggest battery hogs. If you use the Workout app like I do when I’m at the gym, always remember to tap End after completing a workout. I only have a little experience with third-party fitness apps, but the ones I have used have a similar interface to the built-in Workout app. I’d love to hear from you in the comments section below about fitness app you use! When Background App Refresh is turned on for an app, that app can download new media and content using cellular data (if your Apple Watch has cellular) or Wi-Fi even when you’re not using it. Over time, all those small downloads can start to drain the battery life of your Apple Watch. 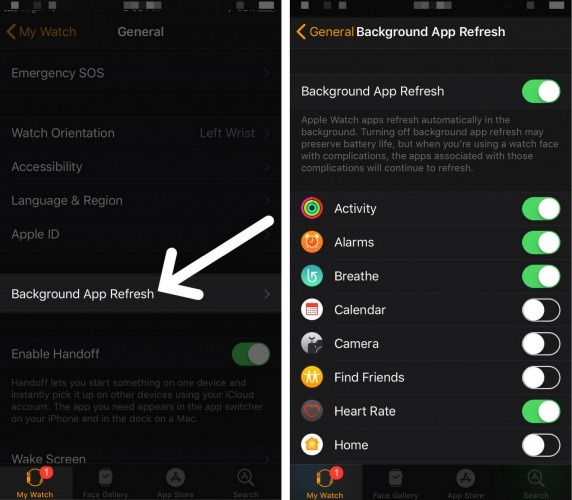 Go to the Watch app on your iPhone, then tap General -> Background App Refresh. Here you’ll see a list of all the apps installed on your Apple Watch. One-by-one, go down the list and determine whether or not you want each app to be able to download new media and content when you aren’t using it. Don’t worry — there are no right or wrong answers. Do what’s best for you. To turn Background App Refresh off for an app, tap the switch to its right. You’ll know the switch is off when it’s positioned to the left. Apple often releases updates for watchOS, the software operating system of your Apple Watch. WatchOS updates will sometimes fix minor software bugs that could be draining your Apple Watch’s battery life. Before updating, make sure your Apple Watch is connected to a Wi-Fi network and has at least 50% battery life. If your Apple Watch has less than 50% battery life, you can place it on its charger while performing the update. To check for a watchOS update, open the Watch app on your iPhone and tap General -> Software Update. If an update is available, tap Download and Install. 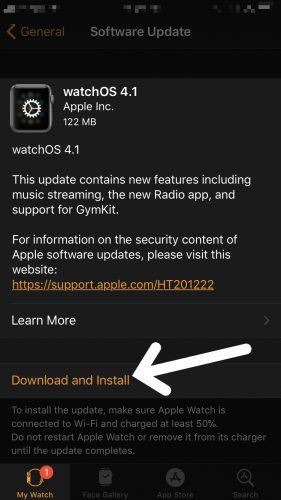 Your Apple Watch will download the update, install the update, then restart. 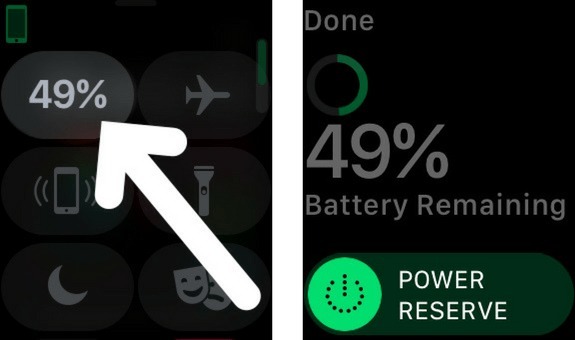 This battery-saving trick works for your Apple Watch as well as your iPhone, iPad, and iPod. 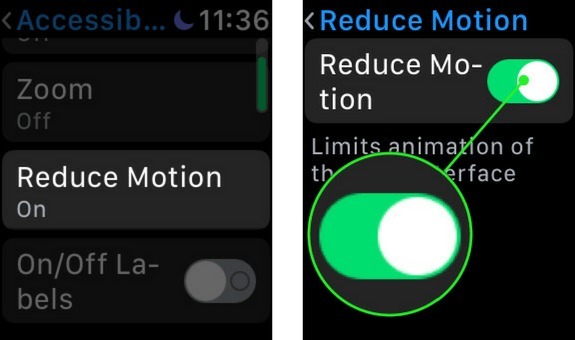 By turning on Reduce Motion, some of the on-screen animations you normally see when you navigate around your Apple Watch’s display will be turned off. These animations are pretty subtle, so you might not even notice the difference! 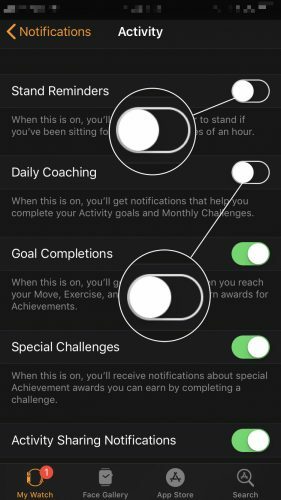 To turn on Reduce Motion, open up the Settings app on your Apple Watch and tap General -> Accessibility -> Reduce Motion and turn on the switch next to Reduce Motion. You’ll know that Reduce Motion is on when the switch is green. Every time you tap to wake the display of your Apple Watch, the display stays on for a preset period of time — either 15 seconds or 70 seconds. As you may have guessed, setting your Apple Watch to Wake for 15 seconds instead of 70 seconds can save you lots of battery life in the long run. Go to Settings app on your Apple Watch and tap General -> Wake Screen. Then, scroll all the way down to the On Tap submenu and make sure there’s a check mark next to Wake for 15 Seconds. If you’ve read our article on extending iPhone battery life, you’ll know that the Mail app can be one of the biggest drains on its battery. 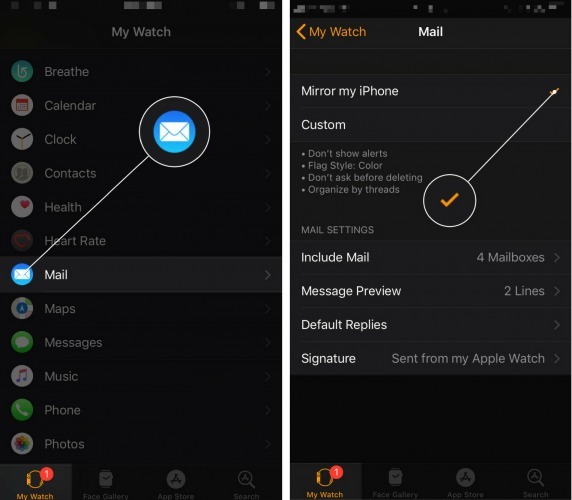 Although the Custom Mail app settings section of the Watch app isn’t very thorough, your Apple Watch makes it easy to mirror the Mail app settings from your iPhone. First, take a look at our iPhone battery article and optimize the Mail app settings on your iPhone. Then, open the Watch app on your iPhone and tap Mail. Make sure there’s a small check mark next to Mirror my iPhone. This step may be a bit controversial because many people don’t actually believe that closing out of apps they’re not using saves battery life. However, if you read our article on why you should close out of apps, you’ll see that it actually can save battery life on your Apple Watch, iPhone, and other Apple devices! To close out of apps on your Apple Watch, press the Side button once to view all of the apps that are currently open. 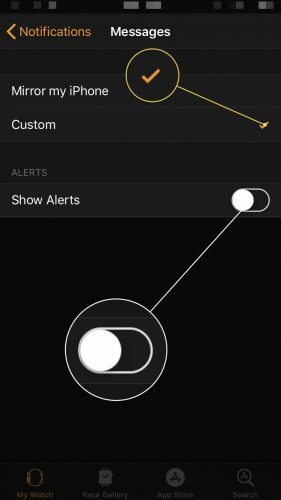 Swipe right to left on the app you want to close out of, then tap Remove when the option appears on the display of your Apple Watch. Another important step in our iPhone battery article is turning off Push Notifications for apps when you don’t need them. When Push Notifications are turned on for an app, that app will constantly run in the background so it can immediately send you notifications. However, since the app is always running in the background, it can significantly drain the battery life of your Apple Watch. Go to Watch app on your iPhone, tap the My Watch tab at the bottom of the display, and tap Notifications. Here you’ll see a list of all the apps on your Apple Watch. To turn off Push Notifications for a specific app, tap on it in this menu and turn off any relevant switches. A lot of the time, your apps will be automatically set to mirror the settings on your iPhone. If you want to keep the Push Notifications on your iPhone, but turn them off on your Apple Watch, make sure the Custom option is selected in Watch app -> Notifications -> App Name. Streaming music on your Apple Watch is one of the biggest and most common battery drainers. Instead of streaming, I recommend adding songs that are already on your iPhone to your Apple Watch. To do this, open the Watch app on your iPhone, tap the My Watch tab, then tap Music. 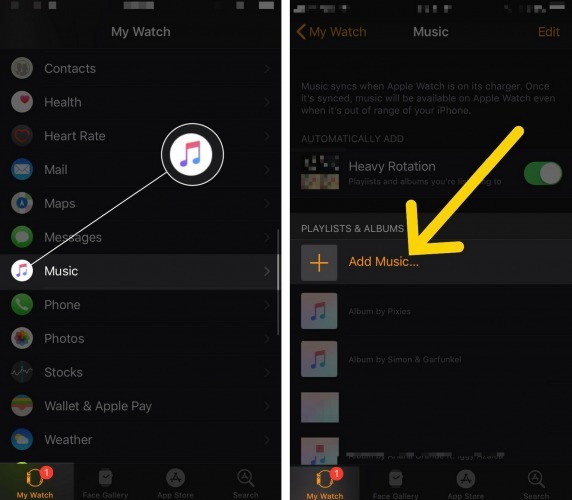 To add music to your Apple Watch, the Add Music… underneath Playlists & Albums. 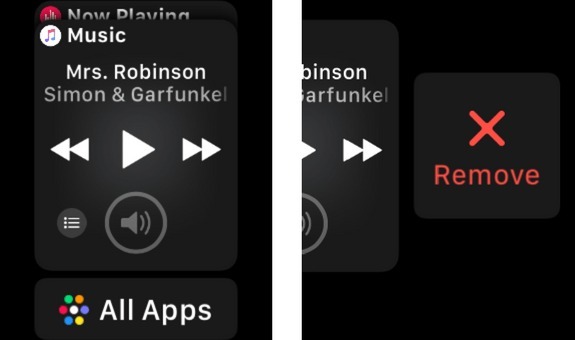 When you find a song you want to add, tap on it and it will be added to your Apple Watch. If your Apple Watch is running low on battery life and you don’t have immediate access to a charger, you can turn on Power Reserve to conserve Apple Watch battery life until you have the chance to charge it again. It’s important to note that when Power Reserve is turned on, your Apple Watch won’t communicate with your iPhone and you’ll lose access to some of your Apple Watch’s features. To turn on Power Reserve, swipe up from the bottom of your Apple Watch’s display and tap on the battery percentage button in the upper left-hand corner. Next, swipe the Power Reserve slider from left to right and tap the green Proceed button. Turning off your Apple Watch at least once every week will allow all of the programs running on your Apple Watch to shut down normally. This has the potential to fix minor software issues happening in the background of your Apple Watch that could be draining its battery without you realizing it. To turn off your Apple Watch, press and hold the Side button until you see the Power Off slider appear the display. 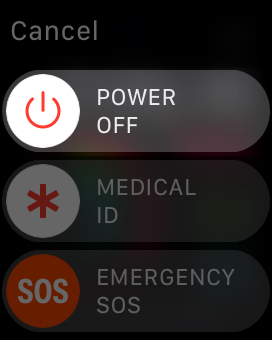 Use your finger to slide the red power icon from left to right to turn off your Apple Watch. Wait about 15-30 seconds before turning your Apple Watch back on. If you have an Apple Watch Series 3 with GPS + Cellular, your Apple Watch’s battery life will be significantly impacted by how often you use its cellular connection. Apple Watches with Cellular have an extra antenna that connects it to cell towers. Constantly connecting to those cell towers can lead to heavy battery drain. If you’re worried about conserving battery life and cutting back on your data plan, only use data when you have to and make sure you turn off Cellular Voice and Data on your Apple Watch when you have your iPhone with you. Making phone calls with a watch is a cool trick to show your friends, but it’s not always practical or cost-effective. Disconnecting and pairing your Apple Watch to your iPhone again will give both devices the chance to pair again like new. This process can sometimes fix underlying software issues that may be draining your Apple Watch’s battery. Note: I only recommend performing this step after you’ve implemented the tips above. If your Apple Watch battery still dies fast after following the tips above, you may want to disconnect and reconnect your Apple Watch to your iPhone. 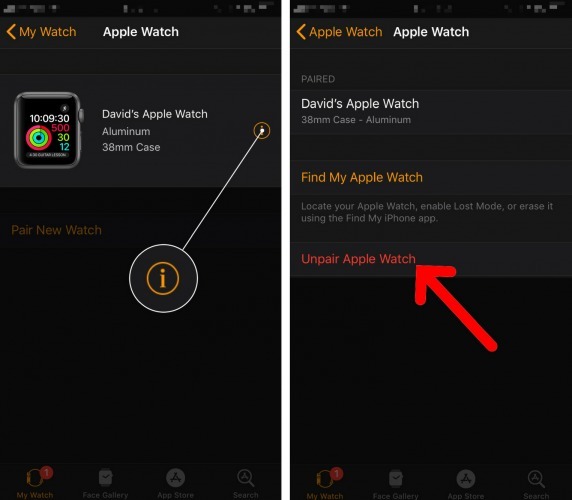 To unpair your Apple Watch and iPhone, open the Watch app on your iPhone and tap the name of your Apple Watch at the top of the My Watch menu. Next, tap the information button (look for the orange, circular i) to the right of your paired Apple Watch in the Watch app. Finally, tap Unpair Apple Watch to disconnect the two devices. Before pairing your iPhone to your Apple Watch again, make sure that Bluetooth and Wi-Fi are both turned on and that you’re holding both devices right next to each other. Next, restart your Apple Watch and wait for the “Use this iPhone to set up your Apple Watch” alert to pop-up on your iPhone. Then, follow the on-screen instructions to finish pairing your Apple Watch to your iPhone. If you’ve worked through all the steps above, but you’ve noticed that your Apple Watch battery still dies quickly, you may want to try restoring it to factory defaults. When you do this, all of the settings and content (music, apps, etc.) will be completely erased from your Apple Watch. It’ll be as if you were taking it out of the box for the first time. 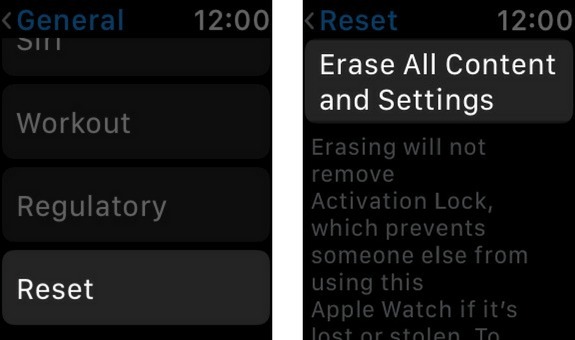 To restore your Apple Watch to factory defaults, open the Settings app and tap General -> Reset and tap Erase All Content and Settings. After tapping the confirmation alert, your Apple Watch will reset to factory defaults and restart. Note: After restoring your Apple Watch, you’ll have to pair it to your iPhone once again. As I stated at the beginning of this: 99% of the time when your Apple Watch dies fast, it’s the result of software issues. However, if you’ve followed all the steps above and you’re still experiencing rapid Apple Watch battery drain, then it may be a hardware problem. Unfortunately, there’s really only one Apple Watch repair option: Apple. If you have AppleCare+, then Apple may cover the cost of the battery replacement. If you’re not covered by AppleCare+, then you may want to take a look at the Apple’s pricing guide before setting up an appointment at your local Apple Store. Why Is Apple My Only Repair Option? If you regularly read our iPhone troubleshooting articles, you probably know that we usually recommend Puls as an alternative repair option to Apple. However, very few tech repair companies are willing to repair the Apple Watch because the process is so challenging. Apple Watch repairs usually involve using a microwave (seriously) to heat up a special pad that melts the adhesive holding your Apple Watch together. If you want to find an Apple Watch repair company other than Apple, do so at your own risk. I’d love to hear from you in the comments if you have had any luck getting your Apple Watch battery replaced from a third-party repair company. Watch Me Save Battery Life! I hope this article helped you understand the real reasons why your Apple Watch battery dies so fast. If it did, I encourage you to share it with your friends and family on social media. Feel free to leave a comment down below and let me know how these tips worked for you! Previous ArticleApple Watch Not Vibrating? Here’s Why & The Fix! Next Article AirPods Won’t Connect To Apple Watch? Here’s The Real Fix!